Check-ups catch gum disease early. That’s good, because infection in the gums can affect your teeth, bones and vital organs. Untreated, it causes more tooth loss in adults than any other factor. It can become a serious health issue that should be treated immediately. In later stages, it can seriously affect your health. Gum disease has been linked to heart disease, stroke, diabetes, respiratory disease and osteoporosis. And in earlier stages, the realities of bad breath and tooth decay can challenge the best of relationships. During a dental checkup, the depth of the pockets between tooth and gum are measured. Gum disease and periodontal disease are one and the same. These refer to serious inflammatory infections including gingivitis and periodontitis. Chronic bacterial infections affect the gums, bones and other supporting structures of teeth. Untreated, they often lead to tooth loss. Gingivitis is the mildest form of the disease, presenting little to no discomfort. Generally caused by inadequate oral hygiene, this early-stage gum disease can be reversed with regular professional cleaning and good oral home care — such as regular brushing and flossing. Untreated, it advances step-by-step to become more serious. Gum disease starts with plaque, a colorless film of bacteria that forms on the teeth. Plaque bacteria produce toxins that irritate gums. Gums become red, tender, and swollen. 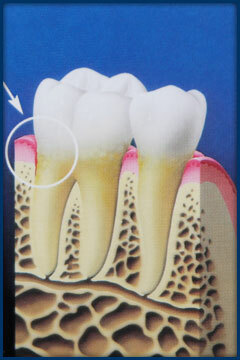 If not removed daily, plaque hardens from the calcium in our saliva, to form calculus (tartar). Over time, tartar spreads beneath the gum line. Toxins produced by bacteria living within the calcified tartar stimulate a chronic inflammatory response that breaks down tissues and bones that normally support the teeth. Infection destroys tissue and bone. Eventually, gums separate from the teeth, forming pockets (space between the teeth and gums) of infections. As the disease progresses, pockets deepen and more gum tissue and bone are destroyed. Teeth may loosen and need to be removed. Other conditions may be affected, including heart disease, stroke, diabetes, respiratory disease and osteoporosis. As pockets deepen, it becomes impossible to clean out plaque through brushing or flossing. Here, the buildup of plaque starts to damage gum tissue. A wide range of conditions and irritants promote development of gum disease. Smoking, Alcohol and Improper Dental Hygiene – Tobacco products, alcohol, impacted food and the improper use of dental floss or tooth picks may irritate gum tissue. Dental Problems and Bad Oral Habits – Badly aligned teeth, poorly fitting bridges or partial dentures, defective fillings and habits like grinding teeth and chewing ice cause problems. Deficient Diet – Evidence links nutritional deficiency and the body’s ability to fight off infection. Women and Hormones – Life stages including puberty, pregnancy and menopause require extra attention to oral health. Pregnant women with gum disease are seven times more likely to deliver preterm, low birth-weight babies. Certain Medications – Oral contraceptives, anti-epilepsy drugs, steroids and cancer therapy drugs may have a negative effect. Disease and Stress – Diabetes, uremia, liver cirrhosis, anemia and leukemia are a few of many diseases that affect gum health. Stress is linked to many serious conditions, including lowered immunity to infections, such as gum disease. Medication – induced dry mouth – Also termed xerostomia, is a common side effect of many types of medications. It is more common in older people (mostly because this groups tends to take several medications) and in persons who breathe through their mouths (mouth breathing). Genetics – Gum disease is also a trait with strong genetic links. Chances are, if your mother or father or someone in your immediate family suffers from gum disease, there’s a high probability that you may encounter some form of the disease as well. Dr. Salee’s thorough oral exam and x-ray review are vital in order to diagnose or eliminate concerns about gum disease. We recommend that adults schedule in-office exams and tooth cleanings every six months. 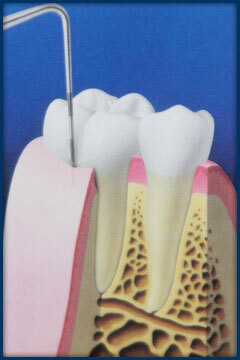 At this time, we employ a painless periodontal probe to measure the depth of pockets between teeth and gum tissue. Dr. Salee uses your pocket depth measurement, exam results and x-rays to determine the precise location, extent and severity of any gum disease. 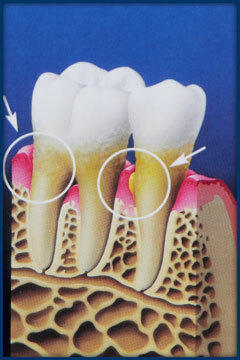 Unusually deep pockets create an environment where gum disease progresses. More Frequent Cleanings – Bacteria at the base of the pocket take up to three months to colonize into numbers that are able to destroy bone. Frequent cleanings help prevent this buildup. Scaling – We remove calculus (tartar) deposits from your teeth non-surgically. Root Planing– Smoothing the root surfaces helps gum tissue reattach to the tooth. Even when successful, most patients require ongoing maintenance therapy to maintain health. Laser Therapy – FDA-approved laser treatments represent a breakthrough in dentistry, providing a no-cut, no sew, no fear option for removing tartar from the pockets where bacteria reside. Periodontal Surgery – Also called pocket reduction surgery, is a periodontal surgery performed in order to reduce the probe-able depth of gum pockets (known as a periodontal pocket). The reduction in this gum pocket allows for less plaque accumulation, eliminates the environment for bacterial colonization and allows greater access for hygiene.